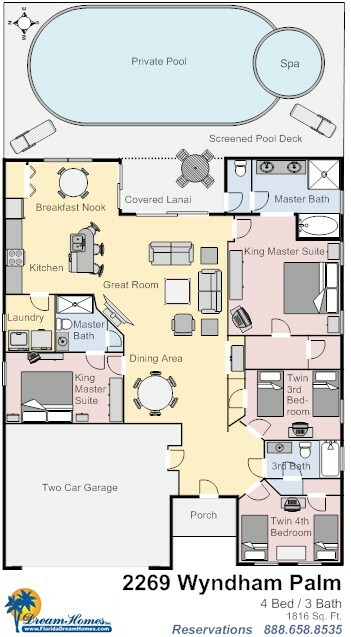 Property Size 1,816 sq. 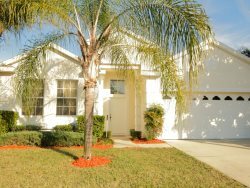 ft.
4 Bedroom/3 Bathroom Home in Gated/Guarded Resort, with Private Screened Pool, Hot Tub, Two Master Suites, Two King Suites, Soaking Tub, Washer/Dryer, Fully Equipped Kitchen, Free Wireless Internet, Expanded Cable, Close to Disney. Pool, Spa, Two Sun Loungers, Table, Four Chairs, Shaded Lanai. The community is located just a minute or two from a full service grocery store and a 24 Hour Pharmacy/Sundry shop. There are also many restaurants (from fast food to fine dining), home improvement stores, mini-golf, Sam’s Club, Costco, BJ’s, and numerous other quaint attractions very close by. This was our seventh year staying with Florida Dream Homes. The first year, we stayed in a condo; then, for the second, third, fourth, and fifth years, at a townhouse. As our family has grown, we now stay in a house. No matter which dream home we have rented, we have found Florida Dream Homes to be the most welcoming, friendly, and professional company we could possibly deal with. Whenever any little difficulty arises, we call, and we never have to wait very long for a remedy. Not only that, but everyone is so upbeat and cheerfulLance, Karin, Tony, Brandonall more than willing to make our stay everything we want it to be. Along with your own fine people, we have found that any subcontractor who had to come to our door was thoroughly known to and trusted by youalways friendly, professional, and trustworthy. We cannot say enough about all the great service we get every year with your wonderful company. We intend to keep using Florida Dream Homes for many years to come. Everything was wonderful and me and my family had a great time. The house was amazing and the service for the house was on time to fix small things. The area was just minutes away from the destination wedding for my nephew and shopping and restaurants right at our finger tips just fantastic. Thank you looking forward to doing this again! It was very comfortable and safe environment. Was like home away from home. House is spacious with beautiful works of art to enjoy. The resort amenities (clubhouse and accomidations) are wonderful. Loved this visit despite so many tragic events that took place in the city during my stay. As usual (this was my third stay with Florida Dream Homes) everything was perfect, from check in to check out. Location was superb and the house was in perfect conditions, exactly as shown on the website. I will definitively recommend it. Thanks to all the FDH team. We rent from Florida Dream Homes often and each time I think we have hit the top and could not get a another house this nice. Then following trip we get a different house. It is decorated differently or has a different setup and again we are thrilled. It is always a wonderful experience and I attribute that to the caring and professional staff at Florida Dreams Homes.